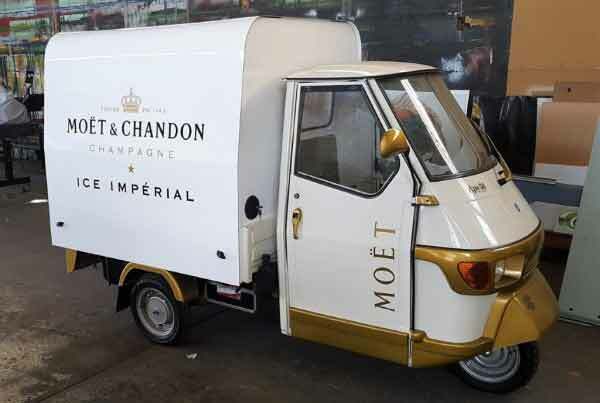 If you are looking for a unique and novel way to promote your business, or perhaps an outlet from which to sell your merchandise, Van Demons can build any type of promotional vehicle, whether it be a truck, trailer or any other kind of vehicle, to raise your brand awareness. Each promotional vehicle built will have different requirements, depending on what you are selling or promoting. We can design your vehicle so that it will ensure your business stands out from the crowd. Whether you wish to attend roadshows, exhibitions, markets and festivals, or even if you are looking for a mobile sales unit – great for new land and building developments – Van Demons can build a quality promotional trailer that will help sell your product. A promotional trailer is a great advertising opportunity for your product, think of it as a moving billboard!